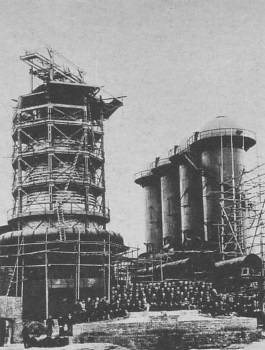 The 'Sites of Japan's Meiji Industrial Revolution: Iron and Steel, Shipbuilding and Coal Mining' cover a series of industrial sites related to iron, steel, shipbuilding and coal mining. They were developed during the rapid Industrial transformation in the Bakumatsu and Meiji periods (1853 - 1912). The WHS comprises 23 component sites in southwest Japan. They are spread out over the towns and cities of Hagi, Kagoshima, Nirayama, Kamaishi, Saga, Nagasaki, Miike and Yawata. 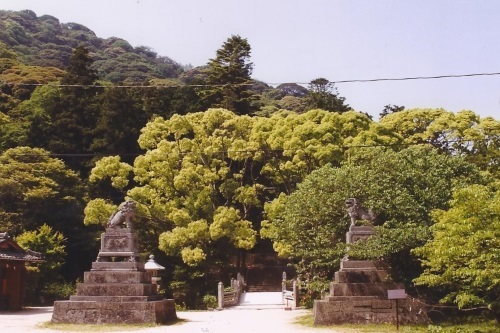 Hagi housed the feudal lords of the Kyushu-Yamaguchi region, ending with Lord Takachika Mori (1819-71) who is associated with the proto-industrial trials around Hagi. 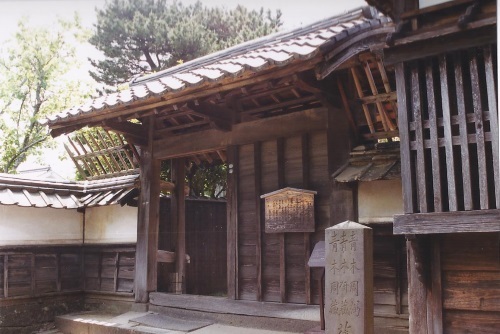 The site includes the ruins of Hagi castle and many original buildings and streets in the well-preserved town, which has avoided the natural disasters that Japan is so prone to. I visited Hagi on my first trip to Japan, in the year 2000. I did so on a day trip from Hiroshima. Hagi was (and probably still is) way off the beaten track. It is situated at the northern coast of Honshu Island, and it took me 2 hours on a bus and a train to get there. The ticket seller even had to ask twice if I really wanted to go there. "Hagi in Yamaguchi district you mean?" The charm of old Hagi proved to be easy to find however. Most of its historical buildings lie in the old samurai neighbourhoods. Long, whitewashed walls that line the streets are characteristic for this area. Some of the old houses are still lived in, others are museums. 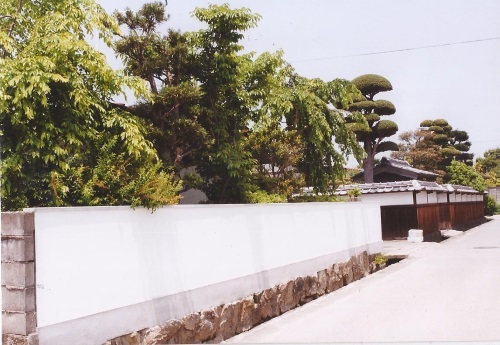 I started at the spacious house of the Kikuya family of Merchants. Not far from there lies the cute little temple Ensei-ji. It is a combination of a Shinto shrine and a Buddhist temple. Besides the usual colourful ticket and a brochure in English, they also provided me with a poster of Hagi. And there were more gifts to come: at the little restaurant where I ate my noodle lunch, the owner gave me a pumpkin to take with me that easily weighed 1.5kg. With the extra weight in my backpack but amazed by Japanese hospitality, I further explored Hagi. I walked a few km along the coast to the Hagi Castle ruins. Only the moats and walls survive til today. It is located in the pleasant Shizuki Park, where the green spring colours attributed to my very bright outlook on this corner of Japan. The connection to a possible future industrial WHS however totally passed me by. "I'm getting too old for this s**t", Danny Glover said when arriving at the Glover Garden. And I thought the same having to suddenly ascend from the tram station on the Glover Skywalk to reach the entrance of the garden. The main reason I walked quickly was because it was already 5pm, the church and garden close at 6 and you never know about the last admission times for these places. So I quickly looked at the Oura church. It is Japan's oldest church and part of the Hidden Christian WHS, one of those few places where you have two separate inscriptions 100m apart from each other and yes, you can see the church from the gardens for those interested in trivia. As it is more of a museum regarding Christianity in Japan I quickly moved on the still reach the Glover Garden in time. Luckily this was the last day it was open until 9:30pm! So the summer times are maybe very different, especially because of a harvest celebrations (Nagasaki Kunchi) still ongoing. Many students were in the park and staying late is actually better to see the town/port from the viewpoint and the illumination of the gardens. All the houses are open, with the Glover House being the best place to see old furniture and some facts about his time in Japan. I didn't know that he was the inspiration for the Kirin beer logo, or so they say. For Westerners they have seen many houses better than this but in Japan this is the oldest Western house and part of the Meiji industrial revolution. Glover was one of the first to come over and start a business and it helped grew the country to the power it became, and the rest is, as they say, history. There are heaps of sites for this inscription. I mainly focused on this because of the lack of time in Nagasaki as the typhoon delayed the trip for other destinations already. 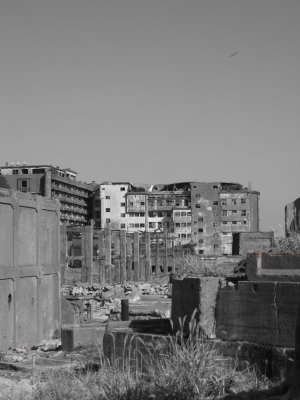 Many tours go to Hashima which was so controversial and delayed the inscription, with the Japanese tourism still not making any mention of the use of forced laborers as part of its history. Having seen a lot of old mines and factories around the world I did not want to seek out any of these, although the Mitsubishi Nagasaki dock is also an included site if you want to stroll down there and have a closer look. I can only speak for the sites in and around Nagasaki, but what I saw was fascinating. On a sunny December day, I started with a tour of Glover Garden, which offers great views over Nagasaki and has some historic buildings from the early Meiji period, including the listed Glover House and Office. The highlight of my visit was definitely the boat tour to Hashima Island (Gunkanjima), a truly weird place, different from anything else I have seen so far. I chose Gunkanjima Cruise for the tour and was satisfied with them. Their ferry “Black Diamond” departs from Motohuna pier, located between Nagasaki station and the Youme Town Yumesaito shopping mall. The boat ride offers some nice views of the Mitsubishi Heavy Industries shipyard, crane and dry dock on the Western side of Nagasaki port and the Kosuge Slip Dock on the Eastern side (all part of the WHS). Thanks to calm waters that day, mooring of the boat at Hashima Island was allowed, and although it was prohibited to walk around freely, it was still possible to gain an impression of the site and take some great photos from the southern part of the island. On the way back, the ferry stopped at Takashima Island for half an hour, just enough time for a short stroll. Further recommended sights in Nagasaki: Atomic Bomb Museum, Peace Park, Fukusai-ji, Ōura Church (part of the WHS “Hidden Christian Sites in the Nagasaki Region”). In June 2017 I visited Nagasaki, where I stayed at Hotel Monterey Nagasaki, which is located a very short walk from the departure point for the Gunkanjima Concierge Company (https://www.gunkanjima-concierge.com/en/). I joined one of their tours to visit Hashima Island, commonly called Gunkanjima (or Battleship Island), an abandoned island lying 15 kilometers from Nagasaki. Its nickname comes from the resemblance of its profile to a Japanese battleship. The island was known for its seabed coal deposits, which were mined, sometimes by forced labor during World War II, from 1887 until 1974, when the mine was closed, leaving the island abandoned. The island was added to the list of UNESCO World Heritage sites in 2015 as one of the Sites of Japan’s Meiji Industrial Revolution, and has only been open to tourists since 2009. 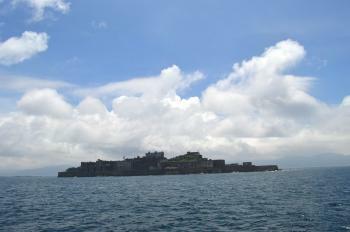 Battleship Island served as the villain's lair in the James Bond film Skyfall. Most of the serial World Heritage Sites include what I would characterize as "strong" and "weak" components, and I typically don't tick a site unless I have visited a strong component. Battleship Island, in my view, is the strongest component in the Sites of Japan’s Meiji Industrial Revolution. (On my same trip to Japan, I visited the National Museum of Western Art in Tokyo, one of the Architectural Works of Le Corbusier that's been inscribed on the list of WHS, but to me it was too uninteresting to justify a tick of that site, which I will only tick after I visit Notre Dame du Haut, which, to me, is Le Corbusier's only outstanding building). Ōura Church, built in 1864 soon after the end of Japan's period of seclusion, is a short walk from Hotel Monterey Nagasaki. Ōura Church is the oldest church in Japan, and, along with a dozen other sites in and around Nagasaki relating to the history of Christianity in Japan, is on the tentative list of UNESCO World Heritage Sites. I also visited Nagasaki Peace Park and the Nagasaki Atomic Bomb Museum commemorating the atomic bombing of Nagasaki on August 9, 1945, the second city upon which an atomic bomb was dropped, three days after the bombing of Hiroshima. On my last day in Nagasaki, I visited the Nagasaki Penguin Aquarium, the only aquarium in the world that focuses on penguins (https://penguin-aqua.jp/english/). Of the 18 typically recognized species of penguin, the Nagasaki Penguin Aquarium exhibits nine, more than any other aquarium. I had intended on ticking off this site by visiting Hashima Island, as it seemed by far the most unique and interesting component. However, I discovered about a month before my planned trip to Japan that all boats out there were fully booked for months in advance, covering the time I would be there. This caused me to abandon the plan to visit Nagasaki, and instead focus elsewhere. Thankfully, one element of the site was still easily visitable from Tokyo, the Nirayama Reverbatory Furnace. Without looking into it too much, beyond directions as to how to visit, I assumed the furnace visit itself would involve a lonely walk from the train station to an out of the way lot where a confused ticket attendant would probably be waiting. Instead, Japanese enthusiasm for World Heritage shone resolutely through. The train car from Mishima station was plastered in a photo of the furnace, largely proclaiming its World Heritage status. The arrival station had directions to the furnace mapped into the footpath all the way to the site itself. When I arrived, I was baffled to see almost a dozen tour buses in the parking lot next door. Over a hundred elderly Japanese men and women were taking turns taking group photos in front of the furnace, and they seemed as confused about my presence as I was about theirs. The adjacent gift shop was larger than the actual site itself, and was dominated by an anthropomorphic anime furnace samurai, a figure plastered across all of the souvenirs. At a normal site, this level of crowding and commercialisation would likely be offputting, but here it was almost wondrous. A site I had built up in my head to be some dingy brick pile in the middle of nowhere that I was venturing off to was instead a huge tourist attraction for some reason. As such I really enjoyed it, even if the site itself can be visited in about 2 minutes and is not at all visually impressive. Since it was abandoned decades ago, the typhoons have devastated the buildings and today it looks really scary like a crumbling deserted ghost town on an island with fortress like sea walls. A Chernobyl but vastly poorer condition. There are several boats that take tourist to visit the island and these boats take their turn landing. You get 45 mins on land and there are developed walking areas to only a small portion of the island. Book early as this has become very popular with locals since WHS. I tried 6 months early and nearly did not get on. There are several on line sites to book. The tours are all in Japanese and so I hired a guide to translate for me. Also try to go in spring or fall when the weather is good. I was told that in August, only half the trips could land due to high swells. If they do not land then they refund you 300 yen of the fare. Even on a good day several passengers were sick. The site has the irony of industry decaying. From sites and components that become the third industrial site which Japan nominated to become a World Heritage Site, I was fortunate to see at least 9 sites during my short visit to Kyushu especially in Kagoshima and Nagasaki. The city of Kagoshima welcomed me with the eruption of Sakurajima, its iconic volcano that erupts at least five times daily. One of the most significant tourist attractions of this Naples of Japan is the former residence of Shimazu feudal lord, the Sangen-en Garden. The residence and garden are really lovely with beautiful landscape design. Part of the Sengan-en, actually located directly at the main entrance, is the former site of Shuseikan which is considered the first industrial complex in Japan. There are 3 sites that still visible. The 1851 Reverberatory Furnace, to be true the site is really underwhelming, only the stone foundations have been preserved. Luckily that there is a smaller replica model nearby to show what it was in the old time. Then I saw 1865 Former Machinery Factory, this stone house which maybe the first western styled building designed by Japanese. Inside the building is the museum about Kagoshima and Shimazu clan’s part on country development and international trade and the old machine still on display. Another site is 1867 Engineer’s Residence; this one is the lovely western styled mansion with oriental touch on the roof. I continued my travel to Nagasaki, at this city, the 1863 Glover House and Office was the first site I saw. The house is located in the lovely Glover Garden. The garden has collection of many colonial houses that had been relocated to this place for preservation, but the Glover House is the only one that located in the original place, so no problem of authenticity. Owned by the Scottish merchant Thomas Glover who play an important role of industrial development in Japan, the house is quite nice especially the veranda and its wood-framed ceiling and the view are really great as well as its status of the earliest Western-style wood-framed house in Japan. On my boat trip to Gunkanjima, I had a chance to see other three industrial sites; the 1905 No.3 Dry Dock, the 1909 Giant Cantilever Crane and the 1869 Kosuge Slip Dock of Mitsubishi Nagasaki Shipyard. The Giant Cantilever is very easy to see from everywhere around the bay, I could see it even from Glover House. I am not sure that Kosuge Slip Dock and No.3 Dry Dock are opened to public or not but the boat trip intentionally slower for tourist to see them and explained their significances (in Japanese). For me, all these 3 sites are just typical industrial sites you can see around the world, dry dock and crane, their OUV are really depend on their roles as the first of their kinds in Japan. The tour boat also passed Takashima Island where the 1869 Takashima Coal Mine located, but nothing can be seen from the boat. 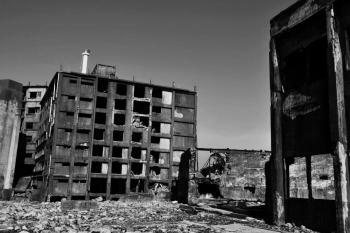 The final destination was the 1890 Hashima Coal Mine Island or commonly known as Gunkanjima or Battleship Island. From a far the whole island is really looked like very scary WWII battleship because of its high seawall. On the island I saw the ruins of the whole mining town. It was a scene of surreal apocalyptic world of debris and near collapsing buildings, a sad place to see, but really stunning! Its story is also interesting that in this small island more than 5000 people lived in its heyday. The island had everything from theatre, pub, coffee shop, school, child care, market, Shinto shrine. The buildings were densely constructed and looked like little Manhattan. The subterranean mine complex were unbelievable that expanded from the island like a spider web, sadly that all of them already collapsed under the sea. The story of hardship of miners were told when we saw the building once was the miners’ bathroom. The guide said the water from the bathroom never stop and always black. Another interesting engineering fact is that one of the buildings in the island is the first reinforced concrete building in Japan and maybe in the Far East! At one point the guide showed us the picture of sea wave hitting the island, it was truly unbelievable that the waves in this area in certain season are very high and can cover the whole island, and one of the activities of islanders was to be on top of the buildings to see this high wave covered their home! Unfortunately that only small area is open for visitor, and the images shown in tourist brochure and documentary are from the closed area, but the island is really impressive to see and give me the idea of how the cities will be if human gone, and maybe one of the best sight of Kyushu and highlight of this nomination! During my 2013 trip around Mt. Fuji and Izu, I unknowingly visited the 1857 Nirayama Reverberatory Furnaces near Mishima City in Shizuoka Prefecture, very easy to be here from Tokyo. 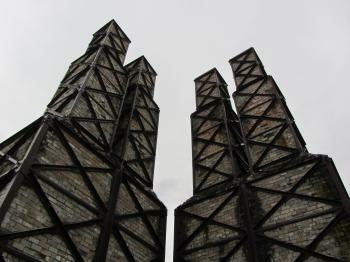 At that time my friend took me there and I really did not know what these four big chimneys are, at first I thought it was some kind of art! Since I am not a great fan of industrial heritage sites, most of them are not beautiful nor are appealing to visit, I really have no idea of how I should admire even I really appreciated its significance for industrial development in Asia. 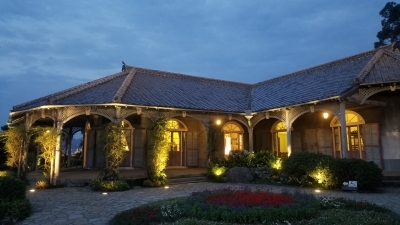 Glover House is maybe the only nice place for casual tourist to visit and enjoy, and possibly also the Kagoshima’s Shuseikan since these sites are in the same area with lovely Sengan-en Garden. However If I have to recommend, I would suggest Gankunjima, it was something extremely different from anything you see in Japan, not exactly Dark Tourism in usual sense like in Hiroshima or Urakami. Is it deserving of World Heritage Site? Probably! UPDATE: Despite protest from South Korea and some counties in Asia, these industrial sites have been inscribed with promise that Japan will revise the site interpretation to cover events until WWII to include story of Koreans who were forced to work. However in my opinion, the inscription gave us an image of more superior of Japanese diplomacy to make sure that the committee will not involve or protest the ICOMOS decision. And the official statement not only protects Japanese interest but insist on the claim that during war time Japan as the state had right to force its citizen which including Koreans to work, a very complex and really ugly but impressive work for legal interpretation. Ironically China aggressive expansion in South China Sea is another thing that helps Japan to reinforce security tie with the Philippines, Vietnam and Malaysia who were under Japanese occupation during WWII and WHC committee to keep silence. In my perspective this nomination is not only show the history of Japanese technology but also its current influence in regional matter and diplomatic competition between Japan, Korea and China very well. Damaged in World War II: Likely several components, but specifically the Bombing of Yawata Steel Works - mostly a failure but at least one bomb hit the site: "These photos showed that only a single bomb had landed within the Imperial Iron and Steel Works complex, and it had hit a power house 3,700 feet (1,100 m) from the nearest coke oven." Forced labour during WWII: "an estimated 60,000 labourers forced to work at seven of the sites, including the island coalmine Gunkanjima, during Japan’s 1910-1945 colonial rule over the Korean peninsula"
Name changes: At inscription: from "Sites of Japan's Meiji Industrial Revolution: Kyushu-Yamaguchi and Related Areas" in nomination to "Sites of Japan's Meiji Industrial Revolution: Iron and Steel, Shipbuilding and Coal Mining"
Controversial at inscription: Controversy between Japan and Korea, about use of forced labor at some of the sites during WWII. Germany mediated behind the scenes to a compromise. 49 Community Members have visited.